One of my top ten matches of all time would be that very dinner with a Chateauneuf du Pape. Châteauneuf du Pape’s wide array of aromas and flavors could include herbes de Provence, spice box, tobacco, raspberries, olives, blackcurrant, licorice, thyme, plum, coffee, cinnamon, blueberries, lavender, and black cherry. 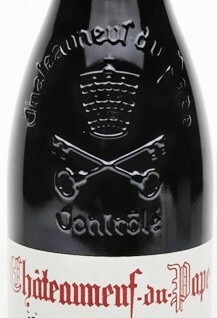 As you can read, there is a lot going on in a bottle of Chateauneuf du Pape and here’s why…. With more than 8,000 acres, Châteauneuf du Pape is the largest appellation in the Rhône Valley. This region makes two wines, a red which produces the bulk of the appellation’s production and a white. Eight red grapes are allowed and five whites. Châteauneuf du Pape AOC permits thirteen different grapes in red wine but the blend must be predominantly Grenache. The other reds permitted are Syrah, Mourvèdre with minute quantities of Cinsault, Muscardin, Counoise, Vaccarèse and Terret Noir. The permitted white varietals include Grenache Blanc, Picpoul, Clarette, Bourboulenc and Roussanne. Chateau Beaucastel is the only one that includes all thirteen, both red and white, in its red wine. Châteauneuf du Pape is located in southern France, in the southern half of the Rhône, on a hot, alluvial plain that’s covered with round stones. Sitting on the surface of the soil, the stones’ duty is to insulate the vines from both the cold and the heat, and provide drainage for the roots. The area of the Rhône is in the path of the fierce, cold wind known as Le Mistral. This wind keeps things cool and also stresses the vines in a different way than the hot rocks. Because of this wind, it’s not unusual to see mature vines untrellissed and low growing. Because of the abundant sunshine and frequent Le Mistral, the use of herbicides or pesticides in the vineyards isn’t needed. The wines benefit from this. They are clean with flavors rarely touched by new oak. Châteauneuf du Pape takes its name, translated new castle of the pope, from the relocation of the papal court in the 14th century. French Pope Clement V arrived in 1309 and ordered more vines be planted to have more wine on hand for the visitors to court. His successor John XXII is the man who really developed the papal vineyards around Châteauneuf du Pape. These wines were relatively light in style and unremarkable. After the court moved back to Italy, the bulk of the production was shipped north to cooperatives to be combined into indifferent blends that were sold in bulk. Modern day Châteauneuf du Pape has its roots in the 1923 precursor appellation system created by Baron Le Roy, proprietor of the renowned Chateau Fortia. Forty years later with the establishment of the AOC, there were only a few making top quality wines. These would be Chateau de Beaucastel, Clos du Mont-Olivet, Clos des Papes, Mont Redon, Domaine du Vieux Télégraphe, and Rayas. Today, there are over 60 estates producing wines that are as good as, if not better than these six top chateaux. Many of these wines are made by a new generation of winemakers and are near term drinkers – generally to be consumed within five to seven years of the vintage, although a handful can age far longer. The finest are concentrated enough to evolve for 15 to 25 years. The most celebrated cru of the region is Domaine du Vieux Télégraphe. The Brunier family has been part of the plateau known as “La Crau” for over a hundred years. They began in 1898 with Hippolyte Brunier. His small vineyard was at one of the highest points near town on a stony plateau called “La Crau”. The elevation was the perfect place to construct in the late 18th century to transmit telegraph messages between Marseilles and Paris. This was unfriendly terrain where only the toughest vigneron planted, although the legendary mistral wind prevented rot. Hippolyte gradually increased his vineyard holdings. Over the years, the Brunier family weathered many storms including phylloxera. Hippolyte’s grandson, Henri, replanted the vineyards, constructed a new winery designed to better control temperature during fermentation, and launched the Chateau’s first bottling with the Vieux Télégraphe label. The wines are classic, displaying rustic strength, earthiness, and tremendous longevity. The old vines of La Crau are all used for the final assemblage. The grapes from the newer vines (all over twenty years old) are used for the wines of Télégramme. Châteauneuf du Pape is a remarkably food-friendly with all kinds of dishes, partly because it suits so much of today’s style of cooking – grilled red meats (like lamb) – with herbs and olive oil. And because of the lack of new oak in many of these wines, they can be enjoyed alongside lighter dishes such as grilled fish and poultry. Châteauneuf du Pape would make a wonderful gift this holiday season. Chateau la Nerthe and Domaine du Vieux Télégraphe, will be on my wish list.